As a company known more for its computers and electronics equipment, you might be surprised to know how much history Toshiba HVAC has in the heating and cooling industry. As the creator of the world’s first residential air conditioner in 1961, Toshiba has a long history of developing cooling equipment. The company specializes in air conditioners and components for the system and is known for developing high quality products that stand out in a highly competitive industry. It’s always smart to get price quotes from at least four pre screened and licensed HVAC contractors before starting your project in order to get the best price. Toshiba specializes in adjustable drives for fans and pumps in heating and cooling solutions. The drives are designed to operate efficiently and to help HVAC units deliver the exact amount of heating or cooling needed thanks to the adjustable technology used. Each of the central ac system unit drives comes with harmonic suppressing, or vibration dampening equipment to help them operate more quietly. Toshiba HVAC drives are built into compact enclosures, allowing the equipment they are used in to be smaller in size. This means that furnaces, air conditioners and other units that rely on Toshiba drives can fit into tighter spaces. While Toshiba offers several different HVAC components, the company also sells a variety of finished air conditioning products as well. With residential split systems, light commercial air conditioners, and multi-zone VRF systems. Toshiba split AC systems are designed to offer heating and cooling to a single room. There are units for spaces between 15 and 60 square meters in size. Some of the split systems deliver only cooling, while others offer both heating and cooling through high-efficiency heat pumps. These ductless units don’t experience heat loss through ducts which helps make them even more efficient, though these units must be installed in every room of a home if they are the only source of cooling or heating available. For light commercial applications Toshiba offers a variety of air conditioner solutions. There are ducted units, casette-type units, outdoor coolers and under-ceiling coolers. The Toshiba solutions are highly efficient and built to cool between 50 and 150 square meters of space. VRF or Variable Refrigerant Flow systems are one of the most advanced heating and cooling technologies in the industry today and Toshiba offers three different variations of the system. 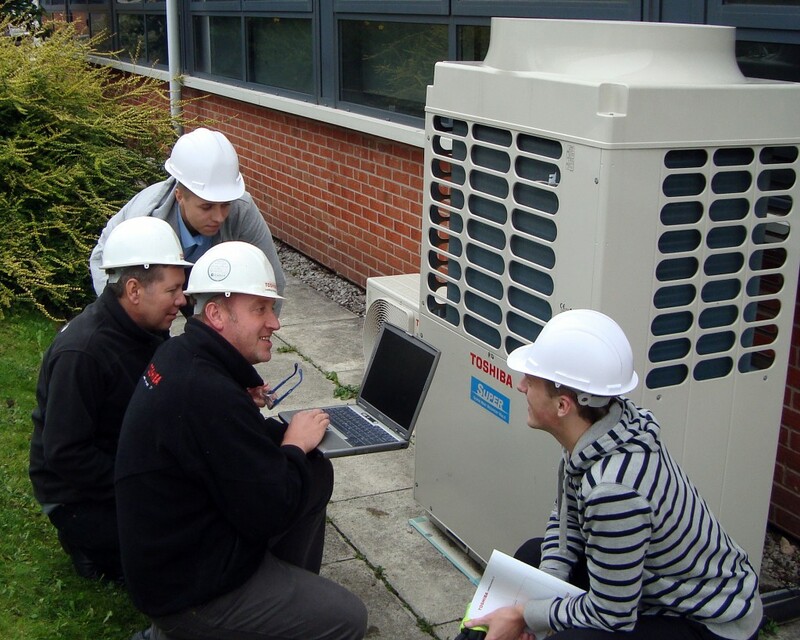 VRF units transfer heat around a building using piped refrigerant. The systems are capable of pulling heat out of the air in one section of the home and moving it to a different section. That means that heat extracted can be repurposed for improved efficiency. Even if heat isn’t repurposed with the system there’s a major reason to make use of VRF technology, and that’s flexibility. A VRF unit is highly adjustable. They can provide only a slight amount of cooling to some rooms and heavy cooling to others, all through the same pipes and the same system. allowing the units to operate continuously at optimum efficiency levels. Power for cooling is only used as it’s needed unlike other systems that simply run full blast most of the time. Toshiba offers a mini 9-unit VRF system and then two different larger systems for small to large commercial applications. The units are worth considering if you have highly variable heating and cooling needs around the office and are trying to find a more efficient way to meet these needs. Toshiba equipment can be attached to central or networkers controller systems for easy management. With the controllers hooked up in place you’ll have one central spot to adjust multiple units and can possibly adjust cooling settings wirelessly. The advanced equipment is designed for easy installation and comes with advanced features that can integrate up to 64 different indoor units into a single control panel for simple use. Whether you need mini-split cooling or heating units for use at home, mid-range air conditioners for a small business, or a large-scale VRF solution for a major business building, Toshiba offers the technology to meet that need.